Accolade Wines’ Global Travel Retail team has seen a busy few months, with a mixture of activations and new listings that has ensured the global wine company is always at the forefront of the travellers’ mind. Throughout last year, Accolade worked closely with Heinemann Sydney to bring exciting activations to its travellers to ensure its premium hero wine brands were always on show during the busiest times of the year. 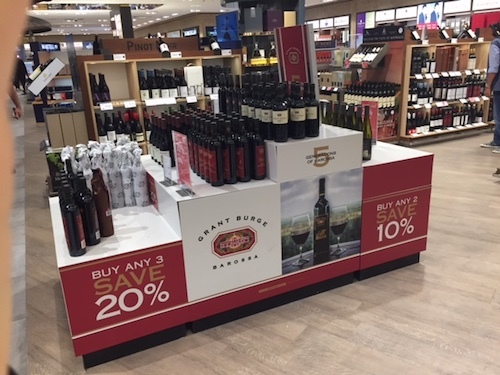 October saw a Grant Burge impulse podium, which heroed the iconic Grant Burge Meschach, whilst November saw Accolade Wines’ first solo House of Arras impulse podium in Sydney International departures. The live podium helped to drive awareness of this multi award winning Sparkling Wine, with a highly impactful instore feature that ensured travellers had only one wine on their mind to drink during the festive season. “Australia is one of our most important markets, so working closely with Heinemann Sydney is a key part of our strategic plan to bring the best brands and best activations to its customers. Since starting this large activation plan, we have seen sales increase significantly year on year, showing that innovation and engagement with passengers is key to converting browsing to spend,” comments Rupert Firbank, Commerical Director. Accolade is also delighted to announce that it has gained 42 new listings with JR Duty Free. To support these new listings, Accolade partnered with JR Duty Free in their major seasonal promotion, branding all the promotional wine space across Brisbane, Perth and Darwin airports from late November through to mid-February, highlighting this phenominal range of premium wines from across various regions of Australia. The “Explore the Best of Australian Wine” campaign extended out of store to include an 8m long window wall in Brisbane, large advertising banners outside the airport and online features. The Australian Campaign complements Accolades’ Global Travel activation “Explore a New World of Wine” that showcases its wines from all across the New World, offering a range of brands, Countries of Origin, grape variety and style, to passengers of all nationalities .